Dendrobium nobile hybrids make stunning potted plants. Staked upright they look exactly like a living bouquet, with flowers spaced so closely that it becomes hard to see the plant underneath. Dendrobium Red Emperor 'Prince', which we used in our Orchid Daze display, is an especially vivid color combination--deep fuchsia and yellow. We are selling them today and tomorrow at our Gently Used Plant Sale. Dendrobium nobile hybrids are seldom seen at retail outlets, unlike the ubiquitous Dendrobium phalaenopsis hybrids which you are probably familiar with. Dendrobium is a huge genus, widespread throughout Asia and diverse in morphology. 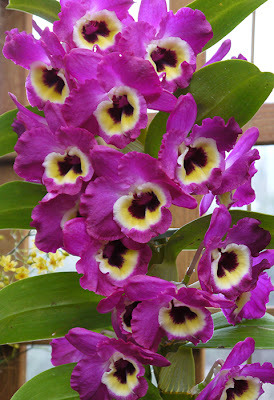 Thus, there are many types (the group is divided into sections) of dendrobiums with different cultural requirements. In a nutshell: warm moist slightly shaded summer followed by cool dry full sun winter. We grow our plants in a 50% shade humid greenhouse and move them to a cold greenhouse (53 to 55 º nights) from November to New Year's. The folks at Yamamoto have produced some terrific pages with detailed cultural information. If you are buying Dendrobium nobiles at our Gently Used Plant Sale I would recommend that you keep them at 55º to 75º in order to maximize the longevity of the flowers.